The history of Turkish coffee is one steeped in tradition and ritual that goes back to 1555. Although these rituals are not all observed in today’s modern world, they remain a part of the lore and legend of Turkish coffee. The history of Turkish coffee or “kahve” as it is known in Turkey is an interesting part of the coffee world and an important part of the Turkish lifestyle and its people. There are many rituals and beliefs that coffee plays a part in and although many of them are not practiced in modern times they remain a part of the Turkish culture. Coffee was introduced to Turkey in 1555 by Syrian traders in Istanbul. Originally the berries were eaten or pulverized and mixed with the fat from animals before being eaten. Later, the pulp of the coffee berries would be fermented and used to make a beverage. This new drink became the favored drink among the Moslem sects. There were royal coffee makers who were summoned to serve coffee to the sultans of Turkey, these coffee makers were known as “kahveciusta” and the entire elaborate ceremony of serving the coffee required the assistance of forty servants. The history of Turkish coffee would not be complete without women. Taught at an early age the proper way to make coffee, young girls would be judged by potential husbands on her coffee making skills. A proper wife would have excellent coffee making skills. Another aspect of Turkish coffee and the betrothed involved the man coming to ask for his intended’s hand in marriage. In olden days, the girl had no say in the decision; her job was to serve coffee to the family and potential husband. History and local rituals say that she was able to express her opinion through the coffee. If she served a sweet coffee then she was agreeing. If the coffee was not sweet she was simply indifferent and if the coffee were slightly salty she was showing her disagreement to the proposal. 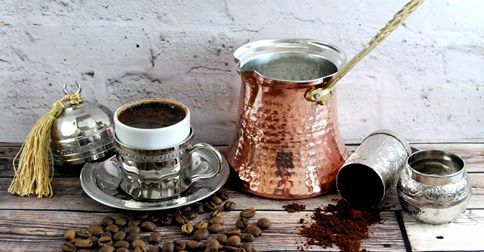 Coffee became a huge part of Turkish lifestyle, such that in some homes special rooms were built for drinking coffee. This popularity was so widespread that more people were spending time in their coffee rooms than they were in the mosques. This popularity also began to threaten the government of the time. They felt that during socialization people were questioning the local government and doctrines. The Ottoman government became so convinced of the threat of the coffee drinkers that they shut down coffee houses and literally outlawed coffee. People caught breaking the laws were beaten on the first occasion and on the second occasion they were drowned in the nearest river. Obviously these laws did not stop the drinking of coffee, in fact, they actually increased its popularity and other countries began taking notice of this new drink. With time the coffee laws were abolished and the popularity of coffee continued to rise. Today, Turkish coffee houses are once again popular social gathering areas and the serving of coffee is as much a part of Turkish life as it ever was. Where to Use Turkish Towels?